Too Convenient? 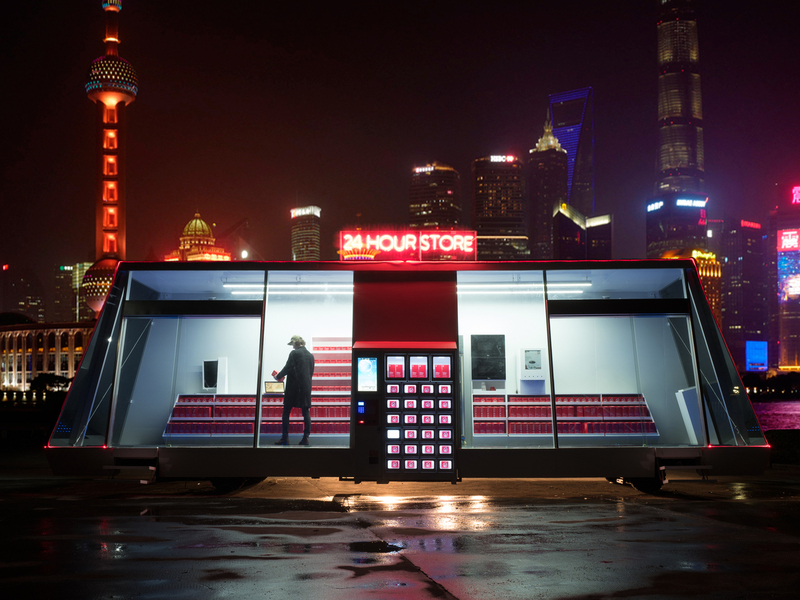 A Mobile Supermarket That Comes To You : All Tech Considered The Moby Mart concept is being tested in China. A 7-Eleven meets driverless tractor-trailer, the store could be summoned by an app and staffed by a holographic clerk. Are we entering WALL-E world? A prototype Moby Mart is being tested in Shanghai. Per Cromwell, the project's lead designer, says four to six additional mobile supermarkets are planned in the coming year. Browse the science fiction aisles and you can find all sorts of dystopian future visions — environmental catastrophes, robot overlords, zombie swarms, triffids. Oddly enough, one of the spookiest scenarios ever conjured comes from a kids' movie. The 2008 Pixar film WALL-E imagines a future in which end-stage consumerism has run amok, leaving the planet utterly trashed and turning humans into helpless, sedentary slugs. By creating a future in which everything is prepared, packaged and delivered by machines, we effectively create a consumer apocalypse, ruining the Earth and dooming the species. For those of us prone to low-simmering paranoia, recent developments suggest the future of WALL-E is closing in fast. To wit: The Moby Mart is a mobile supermarket that eliminates the pesky tradition of getting up and going to the store altogether. Instead, the store comes to you. Like a 7-Eleven crossed with a driverless tractor-trailer, the Moby Mart is an autonomous and unstaffed mobile retail space that you can call up with your phone like an Uber. Like the Amazon Go prototype store, the Moby Mart doesn't have cashiers or checkout lanes. Instead, subscribers scan their purchases off the shelf, pay with a phone app and head out the door. The difference is that the door — and the store — can drive itself to wherever it's summoned. Check out the decidedly bananas demo video, and you'll see that the Moby Mart team definitely has a futuristic vision in mind. Plans call for holographic store clerks who offer personalized assistance as you shop. Moby Marts will be electric and solar-powered, with plenty of battery backup, and will even include built-in air scrubbers so that the store purifies the air anywhere it goes. The space age flourishes get even better: Using autonomous vehicle technology, the Moby Mart could navigate busy streets on its own, piloted by artificial intelligence. A fleet of microdrones atop the vehicle could make door-to-door deliveries — or maybe door-to-window if you live on the 12th floor. When multiple Moby Marts are deployed in a given area, the machines will communicate with one another via cloud computing, trading off surplus items as needed. This isn't just concept-stage noodling, either. A prototype Moby Mart is already up and running in Shanghai. It's a collaborative effort between Hefei University in China and the Switzerland-based company Wheelys, which specializes in mobile retail solutions like bicycle-powered coffee stands. The Moby Mart is just part of a larger initiative to fundamentally change the nature of retail, according to Per Cromwell, lead designer for the project. "Stores needs to be more flexible to meet the demands of the future," Cromwell said, emailing from his offices in Stockholm. "Rents will go up in prime locations, margins will go down on a lot of products due to online retail. Stores need to become more efficient. Mobile and staffless is to date the most flexible and efficient solution. When online and offline merge, a new kind of store is needed." Indeed. It's no secret that traditional retail outlets are in trouble. The Moby Mart is a recent and rather extreme example of a rapidly accelerating trend to make shopping ridiculously, maximally convenient. The previously far-out concept of drone delivery is already here, with heavy hitters like Amazon and UPS testing working systems. Down on the ground, self-driving delivery robots are rolling takeout food right up to your door. Legislatures are passing laws classifying delivery-bots as pedestrians. The robots are even making our pizzas. Cromwell says the plan is to build four to six additional Moby Marts in the coming year, then ramp up production into the hundreds in 2018. The idea is to get Moby Marts into both small towns and big cities and to continually update the mobile supermarket model along with adjacent technologies like self-driving vehicles, artificial intelligence, cashless transactions and solar-powered generators. Obviously, there are still many technological and regulatory hurdles to clear before roaming supermarkets start crawling through our cities. But if the Moby Mart does come to your town, Cromwell said the first wave of stores will specialize in products for immediate consumption, like ready-made food, groceries and coffee. "We will gradually add different products on different markets," Cromwell said. "In the end, there will be no difference in products from what you find in stores today — with the one limitation of larger products. Moby Mart is not ideal for showcasing sofas. But we have some cool ideas for this, as well."